While Android has almost caught up to iOS in the race for apps, Apple is still far ahead of Google when it comes to revenue generated by those apps. The numbers for this revelation come from Piper Jaffray analyst Gene Munster and suggests that Android users are conservative when it comes to shopping on the Android Market. The analysis shows that Android owners tend to shy away from purchasing commercial apps, at least in comparison to iPhone and iPad users who purchased about 12 times more paid apps per device. A substantial 13.5 percent of iOS customers purchase apps while only 1.3 percent of Android users even bother with non-free software on their devices. So, how much revenue are we talking about? The Android market generated just under $350 million in gross revenue while Apple's App Store raked in nearly $5 billion. It would appear that selling apps has turned out to be quite a lucrative enterprise, since both companies received 30% of those totals. For its comparatively poor performance, Munster blames Android Market shoppers for choosing free apps over commercial apps. However, Android users are not total cheapskates. The ASP for Android Market was $3.79 versus $2.01 for the App Store. That means the average amount paid for non-free apps on Android is nearly double that of iOS. This suggests a few possibilities, one of which may well be that Android users are more willing to pay big bucks when they do discover apps compelling enough to pay for. In the report, Gene Munster mentions that, "Google has closed the gap in terms of app dollars spent over the past year" and the analyst believes, "Android will grow smartphone share faster than Apple". 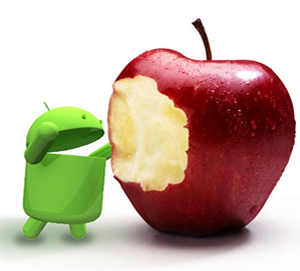 Munster also predicts that Android should catch up to iOS in about three to four years if current trends continue.